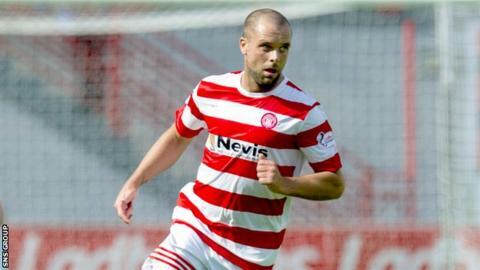 Hamilton Accies' summer signing Chris Turner is facing up to six weeks on the sidelines with a knee injury. The 28-year-old midfielder, who joined from Dumbarton, suffered ligament damage in the 2-0 defeat at Ross County last weekend. "It is not as bad as feared because it could have been a bad one," said manager Martin Canning. "But four to six weeks is being cautious and if we can get him back quicker obviously that would be great." Canning himself is struggling for fitness and the player-boss will miss the visit of Dundee United on Saturday as he tries to catch up after a calf complaint. However, his efforts to strengthen his squad with an additional striker and defender have been frustrated by red tape. The proposed loan signing of Macedonian defender Gjoko Zajkov from Rennes has been blocked over a work permit, following on from the registration issue which prevented the signing of Spanish striker Salva Chamorro. "With the boy from Rennes we knew there was a high percentage that it wouldn't happen, but on the off-chance it would we had a look to see if we could get it sorted," explained Canning. "But we knew it was going to be a difficult process and that's the way it turned out. "In an ideal world if I could get in a striker and a right-sided centre-back, it would be the icing on the cake. But if we don't, I'm happy with the squad I've got."